This 8" manual impulse sealer is ideal for retail, produce, grocery stores, and industrial sealing. This impulse sealer requires no warm up; just plug it in and start sealing as you please. Light weight and portable, this manual impulse sealer has an adjustable time and light indicator that lets you know when a tight seal is ready. We were surprised to find such an affordable impluse sealer and happy it works so well! Used to seal bags of cookies/cakes/other stuff for farmer's markets. It took a few tries to get the correct setting for our bags, but has worked consistantly well for us for 2 years. This impulse bag sealer perfectly seals the candy bags sold on this site. It is so easy to use and only takes a few seconds if that much to seal. We love using this compact sized heat sealer on our products. It helps keep our cake slices and cookies fresh days longer than they would ordinarily be. This sealer is so handy! We just started selling individually packed cookies and selling the baggies with this item will help extend shelf life. Love it! I love this bag sealer! I needed a way to keep my macarons fresh for an event and this was perfect. It created a perfect seal to keep it closed but still able to open it. You do have to play around the settings to figure out which you like, but it is super great! I love using this bag sealer. It heats up quickly and seals even delicate plastic without destroying it. It’s perfect for sealing cookies in cellophane bags. This is a perfect sealer for a small business or even a family where you want to seal bags. We primarily use it to seal sample bags now, but It's had many thousands of uses and we have only replaced the heating wire once. I bought it for my ice cream and tea shop, Great quality. I use it every day to seal my bag I would buy it again when I finished. This sealer is so worth the money. Durable and so easy to use. We seal light weight plastic bags with cookies and brownies and other baked goods. The instructions are not as detailed as I would like, but it works like it should. I use it for sealing 1.5mil bags and it takes about 5 seconds in 3. I am glad I bought it. This sealer is a work horse. Great for use with kraft packaging and durable. Easy to move and use, definitely a no fuss item and well priced to boot. An Excellent sealer. It is sturdy, not flimsy. It heats up very fast. The temperature control dial worked great for me. It allowed me to get the right temperature to seal different bags. I use this product over 100 times a day with little to no breaks and it has proven itself in a short amount of time. I'm very satisfied and I would definitely recommend it to anyone. It's very easy to use, just plug it in, push down and once you hear a small click according to your setting you are good to go! I ordered this sealer to keep my sugar cookies sealed so they would stay pretty and soft! I ordered the candy bags and used them with this sealer! Works like a charm! Very easy to use. Just lay the bag across the seam on the sealer and press down. So simple and keeps my cookies soft and fresh! You can see the seam in the pic. Very pleased with the way they looked in the sealed bags! This bag sealer is wonderful! It is ready to go immediately, is easy to use, and is compact! The price was so good, I purchased it even though I only need to use it occasionally. 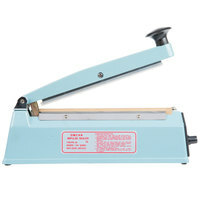 This sealer is perfect for my small business. Easy to use, takes just 1-2 seconds to seal bags. It's a simple machine but serves the purpose. This beautiful blue hunk of metal is what replaced my twist ties and tape sealer! It's heat settings (after you play and get used to it) seals almost any bag I have thrown at it! Love it! The 8' Impulse sealer has changed my life. This has alloed me to package my baked goods at least 10 times faster than hand tieing each bag. An absolute necessity. This bag sealer works great! I use it to seal my cookie bags, then insert messages on the tops of the bag, and seal again. It takes seconds to seal and is very convenient. I LOVE THIS! I dint even know these excited. I make beef jerky and put them in a mylar bag. I use this to seal above the tear strip so that you can tell no one got into to taper it. It has no heat up time and takes 2 seconds, i love it!!! This bag sealer works perfectly to keep my decorated cookies fresh. I searched online for a sealer. After reading the reviews, I decided this was the best for me. The price is also better than many other websites. I make a lot of vacuum bags to freeze portions for lunches. This sealer in the short time I have had it has been incredible. This works wonders. I have had this little sealer for 5 years a not a SINGLE problem. I have used it heavily to seal bags for granola. We have used this bag sealer for many different things. From sealing baked goods to keep them fresh, to making sample bags of our coffee for our customers to brew at home, it has been very useful for us to have around. Prior to purchasing this impulse sealer,, I had to deal with the hassle of waiting for my other heater bar to cool down between bags. That was not ideal when I had to package 300 chicken breasts! I decided to take the plunge and buy this impulse sealer, and don't know how I lived without it. Absurdly fast, no cool-down time, and I can make 100 6" bags within a matter of minutes. Great for making bulk bags, affordable, and saves me a massive headache. So simple to use just pick a setting for how long to seal for, hold down the lever, and then your package will be sealed. This product works out great for sealing bags. This heat sealer bag is very convenient for packaging and is fast and easy to handle and seal. awesome product, heavy duty construction. Seems like it will keep working forever. Heavy cord, heavy body, clearly made for professional use. If I Ever need more than one, I'd by the 12 inch. I love this thing! Was easy to use sealed all the treat bags, cookie bags & also sealed cotton candy for our booth to sale! This Impulse bag sealer is a game changer and money saver. We seal everything! Open a bag of chips well this sealer can seal it back up again so no more stale chips. I also use it to package cookies and treats in bags to freshness. This is an awesome little sealer. I wasn't too sure about this but I am so glad I purchased! Not too big in size but definitely feels sturdy! Shipped very fast! I purchased this impulse sealer for arts and crafts type use in my home. First I have to say that you will not find this product for a better price anywhere - not even close. I have found it to be exactly as described … lightweight and portable but also very hefty and durable. It will give you that professional look to packaging (arts and crafts, baked goods, etc.) that is air tight and water tight. The machine doesn’t require any warm-up time to operate. Just refer to the instruction manual for the correct heating adjustment settings. I am very pleased with this purchase! I have to admit, I was hesitant at first. Oh my goodness.....this is a dream. Super easy to use, works so quickly, and the weight of it makes it easy to stay put. Great product, at a great price. Perfect for heat sealing my homemade baked goods. This sealer is awesome!! I couldn't believe how cheap it was--it really surprised me how well it works! I used it to seal my small peanut brittle bags--worked great!! So far, so good !! Why didn't I have one of these sooner ! It definitely helps with giving a more professional and finished look to packaging. Nice seal band ! A cutter would have been nice to trim up bags that are too long, but that is not a deal breaker. Still futzing with the heat settings for thicker bags, but this is a winner ! Two thumbs up ! This thing is awesome. I love being able to quickly plow through bag sealing on our line and it has an audible click to ensure you don't over-melt and go through the bags. Filled a regular inexpensive bag 4x2x8 bag with water and sealed it with the 8" Manual Impulse Bag Sealer. Flipped the bag upside down and it did not leak. Very glad with the purchase. Takes some practice figuring out what number to use, but once you figure it out, the sealing is a breeze. I was previously using a sealer that I had to mount to a table and use a pedal attached to a chain. It was a bulky set up. The impulse sealer absolutely changed the way I seal up my decorated cookies. All that is needed to set up this sealer is to plug it in, adjust the setting and it is ready to go. Sealing is so simple with this machine and the indicator tells you exactly how long to hold it down for the proper seal. The seal line is thin, clean, and very strong. I am so happy with this purchase and the price on this site is fantastic compared to other sellers. Excellent product for the price. Purchased to seal bags of homemade cookies that I give out at Christmas - makes everything look professional and gives baked goods a little more time to be consumed. Very easy to use - did a few test seals to get the setting correct for each of my bags but had no issues with melting. This is nice to use for sealing almost anything dry, cookies, brownies, candies, dry beans etc. Easy to use and best of all it is very affordable. A must for every kitchen. Love this! So easy to use literally my young kids do it. Old fashion looking but sturdy as a rock and works immediately out of the box. Don't know how I lived without it. I am in love with this heat sealer, it's the best purchase I have made. It's perfect for heat sealing my cookies. I would recommend it to anyone. Very easy to use. This is lightweight, easy to use and does not take up much space. I thought that I had to hold the arm down with more pressure and more time to get my desired effect but not at all. It is very simple and comes with a replacement strip. First off, I was very skeptical on buying this because of the price (so low) but after reading reviews (and LOVING this site) I went ahead and purchased it. So glad I did because it has worked amazingly and now keeps my cookies fresh a little longer. This manual impulse bag sealer has never given us any issues. We don't have need to use it as frequently as we like but would highly recommend! This heat sealer is so easy to use and is perfect for heat sealing our fresh cookies to keep them fresher longer for shipping to our customers. This is an amazing tool for all bakers, even those who bake at home. It seals perfectly, easily and efficiently. It has adjustable heat settings, a simple operation and will keep those baked goods fresh much longer. I bought this sealer for my baked goods to keep it fresh. Works great, just a slight press and it seals. My packaging looks very neat. I bought this impulse sealer mainly for the price thinking even if it does not work very well I would not be wasting a lot of money since we are in Canada, return is not an option. What a surprise to find that this little machine works like a charm. One slight press on the bag with our chocolate bar in it, the end is sealed with no melting chocolate at all. I absolutely love it and have switched from using resealable bags to sealed bags for our products. Take a sealing bag. Press the sealer and your food items stay fresh for days. I did not know how useful it was till I bought it. I purchase this sealer, to use on my cookies bags. It's amazing, I love it. It work wonderful for all of my bags from thin to heavy. Because you can adjust the setting on the sealer. Great purchase! I bought this sealer to package my baked goods so they stay fresh longer. The bag sealer seals out the air wonderfully and my packaging looks very professional. I have started making some sweet sugar cakes and the packing I was using before was clumsy, in buying this sealer i also bought the food bags that can be sealed and they are now displayed beautifully. This is the coolest thing ever! I mainly used my on level 3 heat. The bags ends dont melt off, leaving your bagged treats looking professional! I cant believe how cheap this was....what a great investment for at home businesses! I bought it 2 years ago, and I just barely starting using it and I love it. I use it to prepare small bags of croutons for my salads. It work perfectly. It is very easy to use. This is the perfect bag sealer! Nice for small goodie bags and even snack packs! Works like a charm and easy to use with just about any type of bag!! I like to make all the food we serve at the lub from scratch. This product helps top fill the snack cart on the golf course with in house goods from sandwiches to brownies. I have purchase this item to do some work but i never thought that it work so well. The sealer work execellent with the order I made I am thinking of buying one more great little product. I love how easy it is to use - really doesn't require warm up, and it didn't melt any of the bags (I used the candy bags from webstaurantstore.com) at all, not even on the first try!